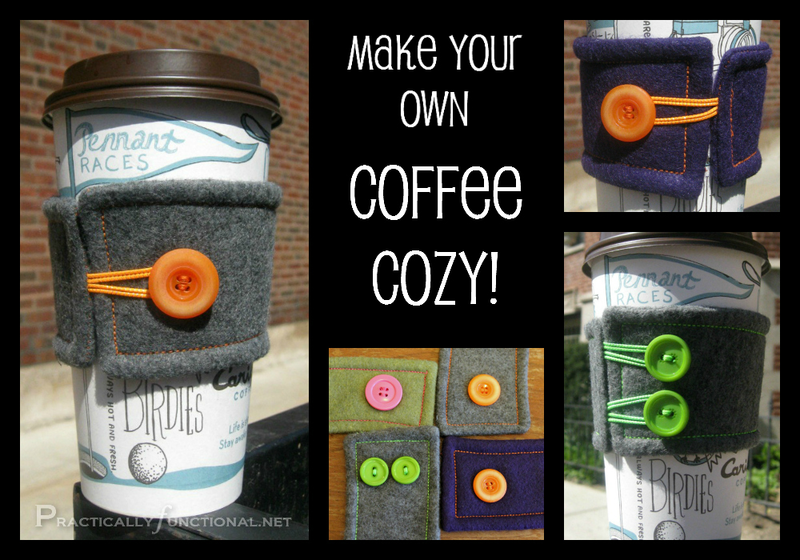 The full tutorial for making these felt coffee cozies is below, but if don’t want to make them yourself, I’ll make one for you! You can find these felt coffee cozies in my shop here! Ever wanted to dress up your coffee cup a little bit? I made an adorable felt coffee cozy and it’s the perfect accessory! Plus it’s much more eco-friendly since you can reuse it time and time again! Goodbye boring brown cardboard, and hello fun colors, felt, elastic, and BUTTONS!!! 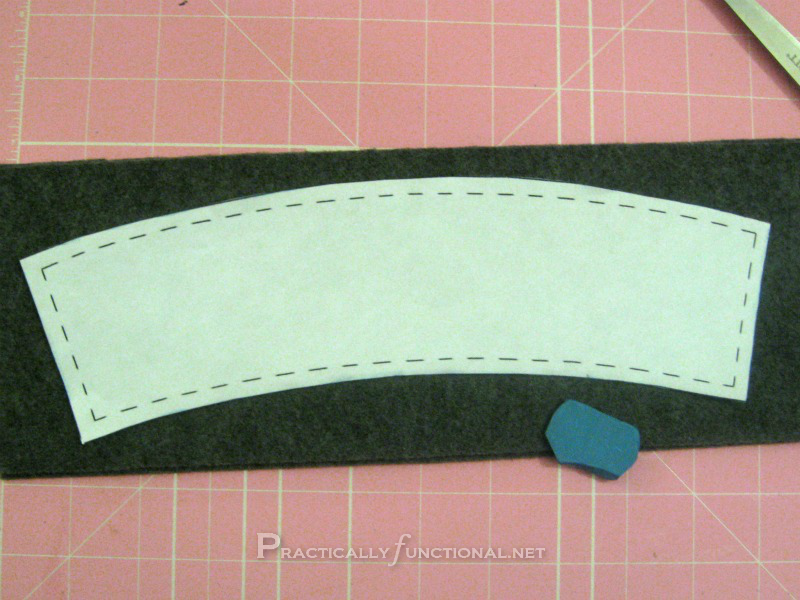 This tutorial and the template provided are based on using felt. Because felt is so thick, I sized the template so that the ends of the cozy just barely touch, but don’t overlap like most cozies (too thick in my opinion). 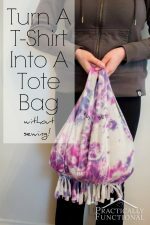 If you want to use a different fabric that’s totally fine! Just remember that the template is sized so that the ends just meet…no overlapping, so you may want to extend the length a bit if you want it to overlap. So, the first thing you need is a template. You can grab a java jacket from Starbucks, take it apart, and trace it if you want. Or, I made a free printable that you can download below. 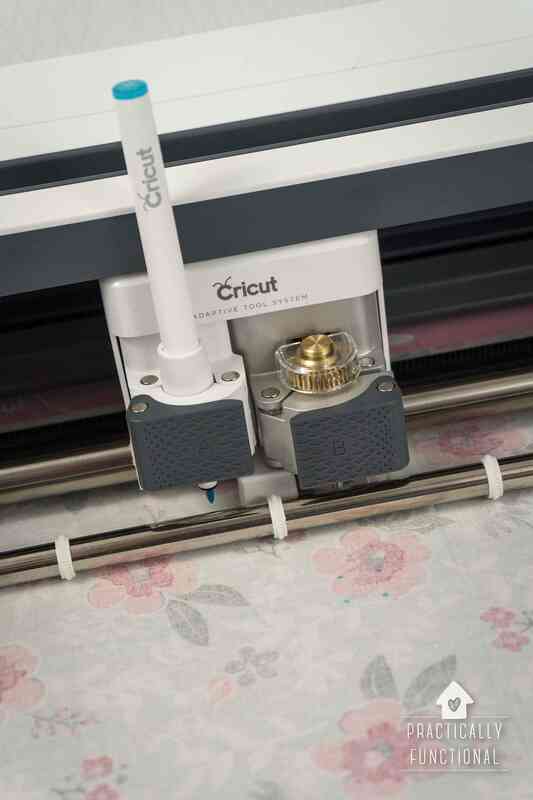 The benefit of my printable is that it’s got the seam allowances already figured out for you! Click the picture or the link to download. 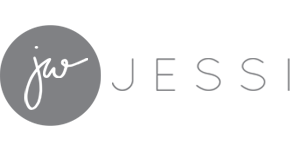 Print out your template on plain paper and cut the shape out along the solid edges (you’ll use the dotted line edges later). Lay the paper template over your felt and cut out two copies. 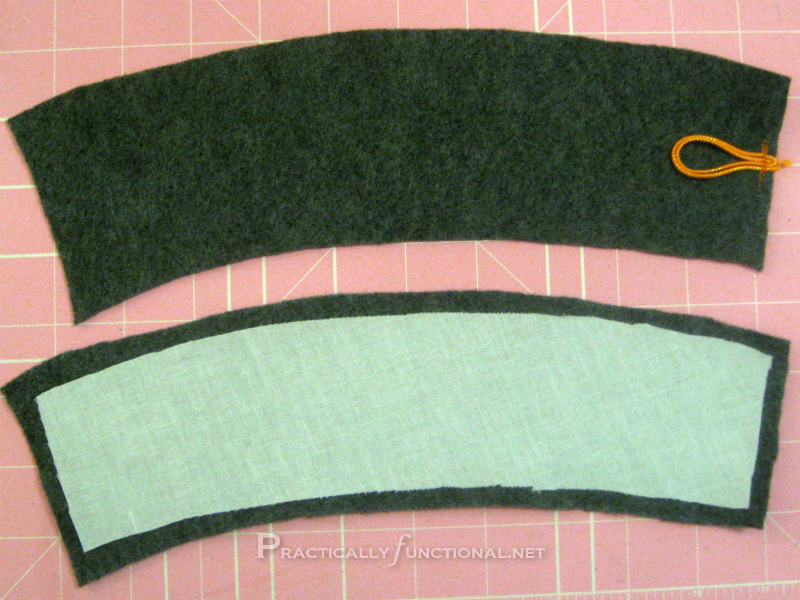 Once you have your pieces cut out, take your elastic and one piece of felt. Pin the elastic down near the edge so that most of the elastic is on top of your felt, not hanging over the edge. 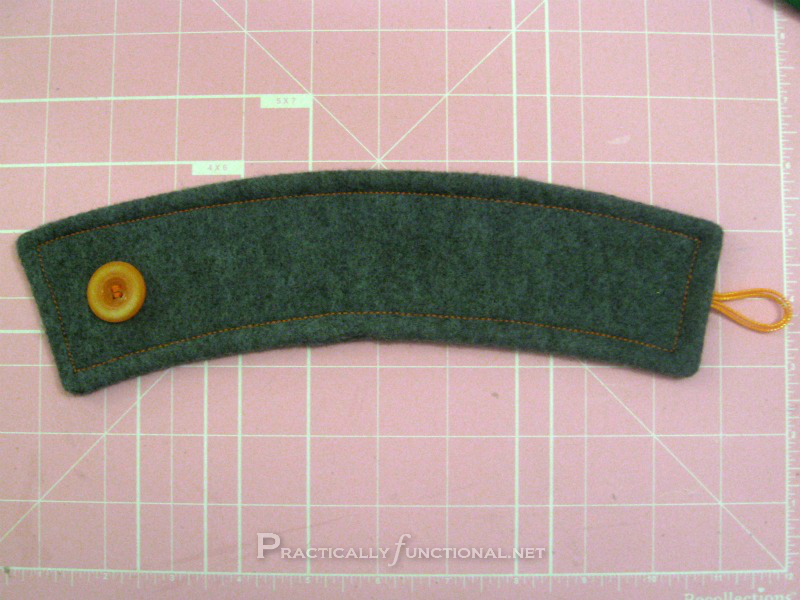 You want about an inch to an inch and a half of elastic on top of your felt. Don’t worry about being precise here; when we position the button later we will measure from your elastic so that it’s a snug fit on your cup. 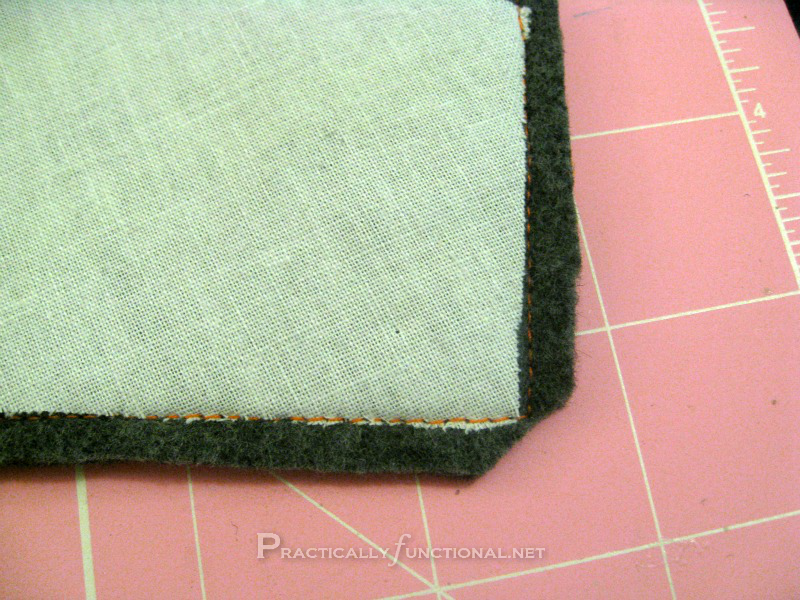 Sew the elastic onto the felt with less than a quarter inch of seam allowance. This part is important; you are just tacking down the elastic so it stays attached later, but you are going to have 1/4″ seams so these stitches need to be made inside of 1/4″ otherwise you’ll be able to see them in your finished coffee cozy. 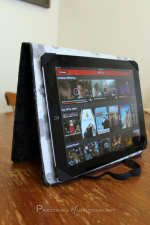 Using interfacing for this project is completely optional. The felt is thick enough that it works just fine as a heat barrier all by itself. But the interfacing makes it a bit stiffer and a bit more heat resistant, which some people might like. If you’re going to use interfacing, take the paper template that you previously cut out on the solid line, and now cut it out again, but this time on the dotted line. This is going to be your template for the interfacing. Lay the paper template on top of the interfacing (lay the interfacing fusible side down so that it irons on to the other piece of felt properly), and cut out one piece. Iron the interfacing onto the other piece of felt (the one without the elastic) according to your interfacing’s instructions. Now you should have two pieces: one with elastic and one with interfacing. Lay your pieces out exactly like this (if you didn’t use interfacing, the bottom piece will just be plain) and then pick up the bottom piece and stack it on top of the piece with the elastic without rotating or flipping either piece. 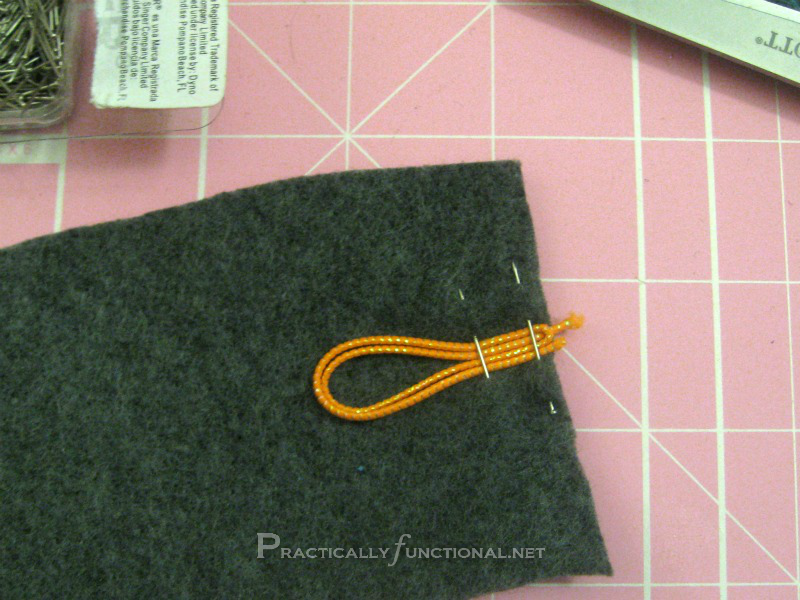 Pin together and then sew with 1/4″ seam allowance, leaving a 1-2″ gap on the short side without the elastic. Make sure to reinforce the stitches on either side of the gap because you’ll be turning the whole thing inside out from here. Trim your excess thread tails and clip your corners at 45 degrees so they don’t bunch up once turned inside out. Turn your cozy right side out through the gap you left in the seam. Be patient and go slowly so you don’t rip the gap open. Once you have the bulk of it right side out you can use the eraser end of a pencil to poke out the corners and seams a bit. Once your cozy is right side out, grab a needle and thread and stitch the gap closed. Then press the entire thing with an iron so that all the seams lay flat. The only piece left to do is the button, and this part is pretty easy! Wrap the cozy around your empty coffee cup and adjust it however you’d like. Then take a pencil, stick it through the elastic, pull the cozy closed around the cup, and mark the felt wherever the pencil tip hits the other end. This will be where you sew on your button! Make sure not to stretch the elastic too much when marking for the button; the elastic and button are just there to hold the cozy closed, they don’t need to make it into a corset! Sew on your button and you’re finished! I had so much fun making the first one that I made four more! 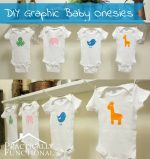 The coolest thing about this project is that you can make these in any color combinations you want by using different felt, buttons, elastic, and thread. I made mine two toned, but you could get pretty creative here! You can find these felt coffee cozies in my shop here! Totally cute! I love the colors you used! I’ve never seen one out of felt before, I’m liking it!! The buttons are adorable too. I think the gray and pink is my fave…although I like them all. Thanks Amy! I just used felt cuz it’s what I had on hand, but it would be fun with any fabric! AAAHHHH, I LOVE these! They turned out adorable!! Thanks Jennette! I hope you love your cozy as much as I love mine! I love these! I would never have to wonder which cup was mine:) Just too cute with the buttons. Thank you for sharing this at Freedom Fridays!! I love this, and I want one. Somethng I’ve never made before. I want them to fit my Mason jars too. Link this post up with me at Wow Us Wednesday ok? Thanks! Absolutely! I’ll try to link up before I go out of town this weekend, otherwise I’ll do it once we’re back home! Totally cute! I think I am just going to have to make one of these. Thanks for the inspiration! I love these! They would make great gifts, and it would definitely be fun to decorate them with felt shapes! I’ve been meaning to try needle felting for a while now, maybe this is the perfect excuse! So adorable!! These would make great gifts!! I’m so glad you linked up at Romance on a dime. I’m pinning this for sure! All linked up, thanks for the invite! 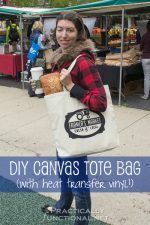 I’m so excited to make one of these! I’m going to make these for stocking stuffers 🙂 Thanks for linking up at Well Crafted Wednesdays! Ohhh these cozies are adorable!!! I’ve been wanting to make some too, you’ve inspired me now! Thanks for sharing this! Featuring you today on Favorite Pins Friday!! What a fantastic tutorial! I’ve seen these coffee cozies around and have been wanting to make one. It’s such a greener way to enjoy my favorite beverage. Thanks for sharing! Thanks for linking this up last week at our Crafty Showcase! We’re just hopin’ around today and wanted to say HI!.Have a super week. Our new Crafty Showcase starts Saturday morning! Hope to see you there! Congrats, Jessi! Your link was my #1 most clicked link in The Mommy Club this past week! Whoot! Whoot! Your project is being featured on my Blog. Stop over and check it out. I will also pin it to pinterest! Yep, I’m following the new blog now too so I don’t miss anything! Thanks Sarah! I’ve made these before – so much fun! Love the tutorial. Found you through the blog lovin’ blog hop. Cant wait to read more of your posts to get to know you better. Did you topstitch once you turned it right side out? Very nice, I like the colored buttons and coordinating top stitch! I love the gray felt with the bright buttons! Sometimes I’m just that into prints but doesn’t mean I feel drab, right? Thank you for sharing a great tutorial! I am a Pumpkin Spice Latte girl myself. These are so super cute! They are so trendy right now :). I was drinking a slushy over the weekend. The weather was still cool and windy and I had to keep switching hands! 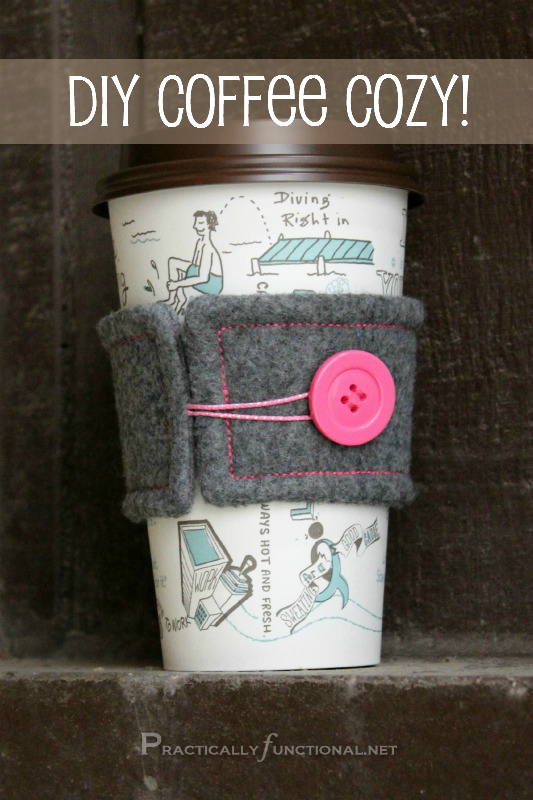 I said to my husband that I thought a “coffee cup cover” would be great for cold drinks too! This would definitely work and help keep it colder longer!